Billy Jacobs is a prolific contemporary American artist specializing in rural landscapes. He was born in Detroit, Michigan and grew up in Ohio, where the rural surroundings of his childhood subsequently inspired his artwork later in life. Farms and barns are prevalent in his work. Most of Billy’s watercolor paintings are faithful renderings of actual locations in Ohio and Pennsylvania. His painting career has its roots in folk art. 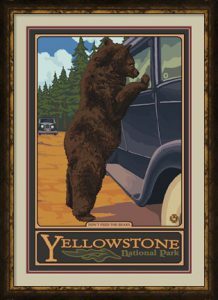 Billy’s rural landscape prints have garnered a great deal of acclaim over the past decade. His distinctive, folksy style is infused with timeless charm. Elephants are the most magnificent mammals to walk the face of the earth. They’ve inspired artists with their sheer majesty for generation after generation, from prehistoric times through the present. Our expanding collection of Elephant pictures contains a wide variety of pieces, with an extensive range of styles. The smallest artwork measures less than 12 x 12 inches and the most massive are as enormous as their subjects. While our collection is light on cave paintings, you will find many of the selections rendered in the latest trend-setting styles. The first pair of our favorite large elephant pictures packs quite a punch. 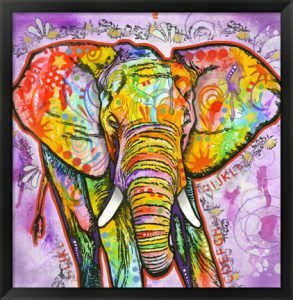 We’ll start with the wonderfully colorful pop art Elephant by Dean Russo. 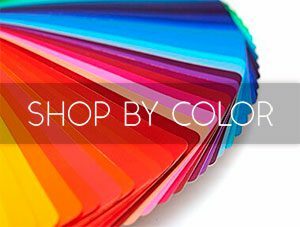 At a maximum size of 47 x 48 inches, it’s as big and bold as can be. John Banovich’s remarkable Power of One photograph (shown below), weighs in at 48 x 40 inches. Once upon a time, informal decorating styles were described in wide-ranging terms like eclectic and bohemian, to differentiate from the more common (and dare say it, mundane) genres. Suffice to say, we’ve come a long way. We’re no longer constrained by traditional design rules and archaic production technology, thanks to the digital revolution. When it comes to nature-infused artwork, we’re now living in an age of endless choices. Whether you opt for an Earthy Chic, Lakehouse Life, or Glamping style, the options are endless. With a well-chosen set of framed racing prints on your walls, you don’t have to “go fast or go home.” You can have it both ways! 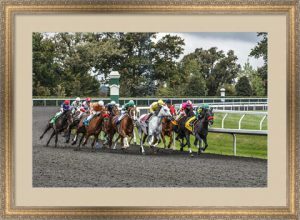 The FramedArt.com collection features a fabulous selection of racing artwork, across genres. Rest assured, motivation needn’t be motorized. Prefer the sound of thundering hooves or the whir of chains and sprockets to the rumble of race-tuned engines,? FramedArt.com has it covered!